Jackpot Capital Casino always has huge bonus promos, but this month the money ($85,000!) will be spread around more players. 300 will get up to $500 bonuses every Monday. Meanwhile, they'll be island-hopping in paradise for more game bonuses. 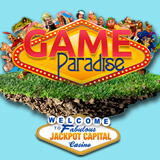 During the $85,000 Game Paradise casino bonus event, get special offers for selected games and collect some of the $85,000 in casino bonuses along the way. Each week, the promotion page will feature a different island to be explored. On each island, players will discover special casino bonuses for designated games. This week it’s Wealthy Island and bonuses are being given for games like the new Lucky 6 and God of Wealth slots from Realtime Gaming. Next week it will be another island with more great games to try. Earn points when you play in Jackpot Capital's online casino or in the mobile casino. This month more frequent players than ever -- 300 every Monday – will get weekly bonuses up to $500. $15,000 in bonuses will be awarded to top players every week until June 12th. Everyone that plays even a little qualifies for additional randomly awarded prizes every Friday. Even if you've only played a little that week you qualify, so everyone has a chance to win. There will also be $5000 in coupons delivered by email! The randomly awarded bonuses on Fridays give you a chance to play more through the weekend to improve your Scoreboard ranking and qualify for bigger bonuses during Monday bonusing. Jackpot Capital Casino offers hundreds of slots and table games from RTG including the new Super 6 6-reel Chinese-themed slot game launching tomorrow. Like all of the casino’s most popular games, it will be available in the download, instant play and mobile casino.